Leonardo Barilaro is behind a ‘groundbreaking’ concert, which will bring together traditional acoustic piano and electronic synthesiser. He tells Stephanie Fsadni more about his music, reflections and lifelong aspirations. An Italian aerospace engineer with a passion for music has sky-high ambitions: he aims to play his compositions on Mars before turning 50. But, in the meantime, he is more than excited to play his innovative works to local audiences. 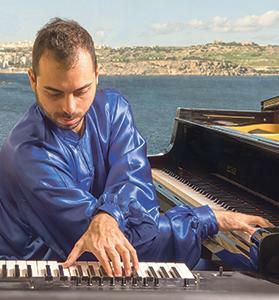 On Friday, University of Malta researcher and maestro Leonardo Barilaro will hold an acoustic piano and synthesiser concert titled SeaSharp, a labour of love that encapsulates his emotions and reflections on life. Composer and musician Leonardo Barilaro is playing original works during a concert titled SeaSharp on Friday. “Doing what we love is a beautiful gift. Since I was 13, I never lived music and science as a dichotomy,” says Barilaro. Barilaro has indeed many other interests, including photography and Chinese martial arts, but his major other passion is freediving. He feels at one with the sea and considers the infinite body of water to be a “perfect metaphor of life”. “Freediving showed me that all the different aspects of the inner world come together at 25 metres underwater without breathing. Every time I go up feels like a rebirth,” he comments. Such thoughts and experiences inspired the title of his concert. SeaSharp can also be read at different levels. “It can mean to see (the world around us in a) sharp (way),” says Barilaro. “C# minor is also the main key around which the pieces of the concept orbit. Moreover, the last piece ending the concert, Sonic Sky, is fully in C# minor and in it the main themes of the previous music appear again, filtered and evolved. “It can also be interpreted as having a sharp inner sea, that is, clear and transparent,” he muses. The one-hour show will present original works which Barilaro considers to be “groundbreaking” due to the type of union between the traditional acoustic piano and electronic synth. “Piano and synth are used in concerts by some top-level artists, like Jordan Rudess, Nils Frahm and Ariadna Castellanos, but very rarely are they played together at the same time and without the support of a drummer or other musicians on stage,” he points out. The pieces are interconnected and the composer would like the audience to “breathe in” his works, like in meditation. But what kind of sounds should they expect? “Every time people ask me this question, I find it really difficult to give a precise answer. It’s hard to label my music… It is not jazz, it is not neo-contemporary music and neither is it minimal music. The music I am proposing nowadays is a hybrid in continuous evolution,” he explains. The ultimate aim of the concert is to trigger emotions but Barilaro hopes the audience will only clap at the end of the show. “I believe that the dimension of the live show always creates a dynamic bridge between who is on the stage and the listeners. Everyone reads a story through his own eyes but inevitably something inside changes on both sides,” he notes. Leonardo Barilaro has graduated at the Music Conservatory of Padoa, Italy, with Franco Angeleri and studied composition with Luca Mosca and Claudio Rastelli. In parallel, he developed his passion for synth and electronic music. One of his mentors was Jordan Rudess, the keyboardist of metal band Dream Theater. In 2006, he started his project Nullo Die Sine Nota (No day without a note), a concept originated from a filtered sentence that Roman natural philosopher Gaius Plinius Secundus (Pliny the Elder) wrote for Greek painter Apelles and it is also his own personal “mantra”. So far, he has had the opportunity to share his music in different countries outside his native Italy, including Germany, the UK, the Netherlands and Turkey. In Malta he presented new music twice during the Malta International Arts Festival and also did two classical music concerts with tenor Nico Darmanin. He has also released four albums. As regards his academic background, Barilaro graduated with a PhD in sciences, technologies and measurements for space (STMS) at the University of Padua in 2011, with his research focusing on new techniques to study the space debris risk mitigation. During this period, he took part in an exchange programme at Cranfield University (UK) and in the Rexus/Bexus Programme of the European Space Agency, with the Scrat Experiment. He also pursued academic work as post-doc researcher at Cisas, Centre of Studies and Activities for Space (Italy). He acquired industrial experience working for five years for multinational corporations like Maserati, SIT Group and Methode Electronics, as part of research and development teams and developing new products. He has recently joined the Institute of Aerospace Technologies team at the University of Malta. His main project is related to the development of an innovative interface for a multipurpose detachable pod to be attached to a SmartCopter, the new generation of gyroplanes designed by Celier Aviation for humanitarian missions, environmental management, law enforcement and security, recreation and other commercial uses. For more information about Barilaro’s works, visit www.nullodiesinenota.com. SeaSharp is being held at Studio B, Spazju Kreattiv, in Valletta on Friday at 8.30pm. The event is being organised with the support of the Italian Cultural Institute. For tickets, log on to www.kreattivita.org.